Originally conceived as the Model 101 in 1969, the Model 200 was a development of the Model 100 King Air. It had essentially the same fuselage as the Model 100, with changes to the rear fuselage to accommodate a new T-tail and structural changes to allow higher maximum pressurization. Changes included Pratt & Whitney Canada PT6A-41 engines rated at 850 shp and increased wingspan and extra fuel capacity over the Model A100 then in production. The first prototype flew October 27th, 1972 with a second prototype took to the air on December 15th that same year. The 200 received civil certification in December 1973 with the first civil delivery took place February 1974. The Model 200T was the next model in the series, developed in 1976. This was specially designed for aerial surveying or reconnaissance. Modification changes included changes to the belly aft for photography with a vertical camera, a surveillance radar in a pod under the fuselage, dome shaped windows on the sides of the rear fuselage allowing observation, and a 50-US-gallon (190 L) fuel tank on each wingtip to increase the aircraft's range. In 1979, the Model 200C was created with a large cargo door, allowing a large range of items to be loaded into the cabin. They quickly became popular with operators who fitted them out internally as air ambulances. In 1981, Beechcraft modified a Model 200C as the Model 200CT fitted with the same wingtip fuel tanks as installed on Model 200Ts.Only one was created, but it lead to the Model B200 which entered production that same year. The Model B200 was fitted with PT6A-42 engines that resulted in greater aircraft performance. Maximum pressurization was increased (to 6.5 psi differential) and changes to the cockpit layout. The Model 200C gave way to the Model B200C the same year, with the first Model B200T and Model B200CT being modified from a B200 and B200C respectively, the following year. The next major innovation occurred in 1984 with the B200, B200C and their derivatives being fitted with a revised landing gear retraction mechanism. This replaced the earlier electro-mechanical retraction system of gearboxes, driveshafts and chains and sprockets that was a throwback to the Twin Bonanza. The propellers fitted were changed from 3-bladed Hartzells to 3-bladed McCauleys. Over the following years, various models were offered including the Model 1300, a 13-seat high density configuration with a belly cargo pod marketed as a commuter airliner. 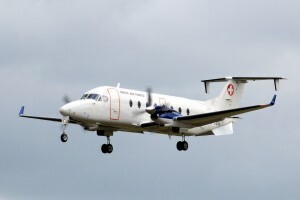 Also, from October 1995 Beechcraft offered an updated B200 with Electronic Flight Instrument System (EFIS) avionics and marketed it as the “B200SE Super King Air.” “Super” would be dropped from all marketing/advertising the following year. In October 2003, Beechcraft began fitting the B200 with the Rockwell Collins Pro Line 21 suite. Hawker Beechcraft would announce the Model B200GT on May 21, 2007 during the 7th Annual European Business Aviation Convention & Exhibition. An updated version of the B200, the B200GT comes fitted with the PT6A-52 engine; developed to deliver maximum power to an even higher altitude than the -42 it replaced, further improving aircraft performance. Variants with the popular large cargo door option were designed and put into production after receiving Federal Aviation Administration certification on November 16th 2007.